large. We discuss the past six years of progress and examine the key problems that remain. 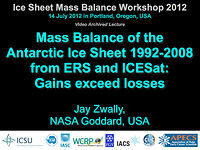 The work presented here is based on the Ice-Sheet Mass Balance and Sea Level (ISMASS) workshop that was held in Portland, Oregon, USA, on 14 July 2012. This workshop was jointly organized by the Scientific Committee on Antarctic Research (SCAR), the International Arctic Science Committee (IASC) and the Word Climate Research Programme (WCRP), and was co-sponsored by the International Council for Science (ICSU), SCAR, IASC, WCRP, the International Glaciological Society (IGS) and the International Association of Cryospheric Sciences (IACS), with support fromClimate and Cryosphere (CliC) and the Association of Polar Early Career Scientists (APECS). Results from that workshop, videos of presentations and more can be found here: http://www.climate-cryosphere.org/en/events/2012/ISMASS/Results.html.